German PSU, chassis, and cooling specialist be quiet! has launched its first water cooler product. The Silent Loop all-in-one liquid cooler uses a full copper radiator, Pure Wings 2 PWM fans, flexible bend-protected tubes, plus durable full copper parts and refill port to make its design stand out from the crowd. However the Silent Loop's pièce de résistance is its "unique reverse-flow pump technology" said to provide quieter, vibration-free, operation. Let's start by looking this is pump technology. be quiet! 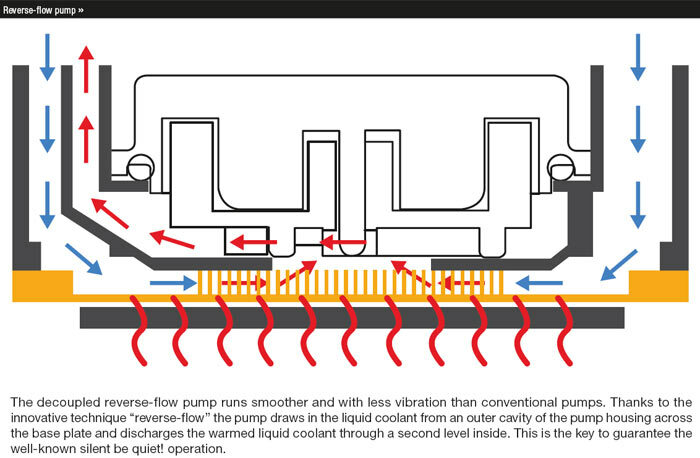 says that it uses a decoupled pump designed to reverse the cooling circuit. Explaining its operation, we are told "Liquid is drawn in from the outside over the cold plate, then transported through a second layer on the inside of the radiator." The pump operates at 2,200 revolutions per minute which is said to produce less vibration compared to other AiO liquid coolers on the market. be quiet! boasts of its quality construction materials; the black coated full copper radiator, the copper base, and the nickel-plated cold plate - all contribute to the unit's durability and performance says the firm. Though the Silent Loop is essentially maintenance free, be quiet! 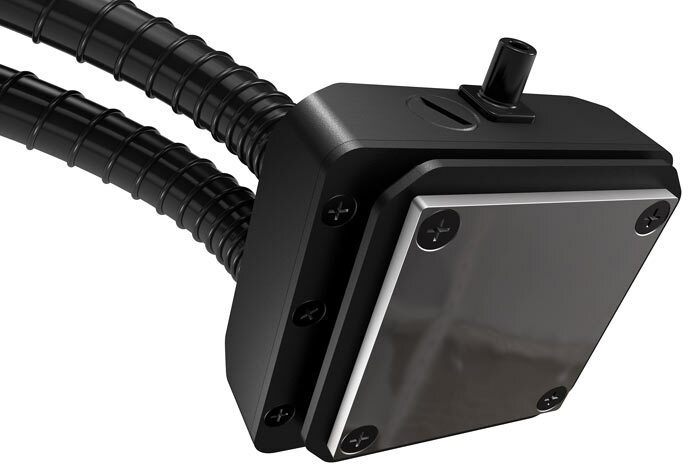 has implemented a refill port for proper coolant levelling after prolonged use – this preserves continuous performance and low noise levels for the life of the unit. To accommodate various system build constraints be quiet! has three variations of the Silent Loop available. There's the Silent Loop 120mm, Silent Loop 240mm, and Silent Loop 280mm, all using a pair of be quiet! Pure Wings 2 PWM fans. The smallest version uses two 120-millimeter fans in a push-pull configuration, the 240mm version uses a pair of 120mm fans, and the 280mm version uses a pair of 140mm fans. All models are compatible with the latest AMD and Intel sockets and are "effortless" to fit thanks to be quiet!s "well-designed mounting kit". The new be quiet! 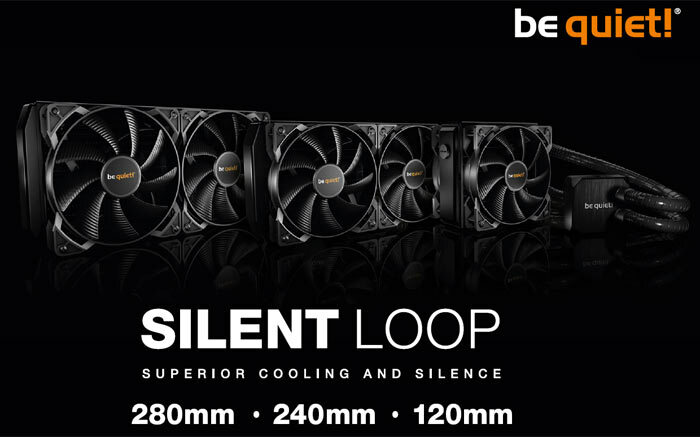 Silent Loop coolers are said to be available immediately with an MSRP of €109.90 / £94.99 (Silent Loop 120mm), €129.90 / £109.99 (Silent Loop 240mm) or €149.90 / £129.99 (Silent Loop 280mm). Whichever model you buy you get a 3-year warranty. About time a maker produced one with the option to top up, just in case….. Though i expect a few people might be caught out by leakage at some point or another. After recently purchasing an Antec unit, I'd have rather paid more! Seems a comparable price to the Corsair H80i GT (in 120mm format). Whilst it certainly keeps things cool, I'd have liked a little less noise from my Corsair. Would probably have bought this instead if it had been available at the time as I like be quiet! fans.